Island visited by 4 members. 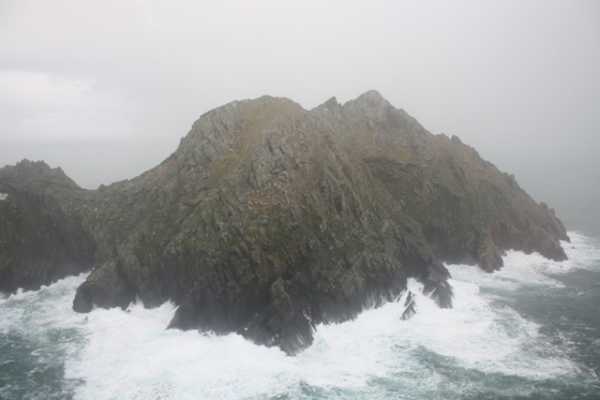 This is the most westerly of the Blasket Islands. Its profile is remarkably similar to that of Skellig Michael. Its only human inhabitants were the lighthouse-keepers and their families. As the lighthouse was on the side facing the Atlantic, the view only reinforced their isolation. A natural rock-arch connects the two parts of the island. An Tiaracht is the 1392th highest place in Ireland. An Tiaracht is the most westerly summit in the Dingle West area. It's also the most westerly summit in Ireland. This photo, taken through the window of the helicoptor, shows the rugged cliffs and rocks of An Tiaracht being lashed by the violent sea. It is easy to see how a landing by boat would be impossible.